The final 287 jobs at Delphi Flint East have been shipped off to Mexico, bringing to a close the eventful and illustrious manufacturing history that took place on a stretch of N. Dort Highway in Flint. On June 11, 1998, Flint East followed in the footsteps of Flint Metal Fab, taking part in one of the longest strikes in GM history. The 54-day strike for which Flint East was a part almost stalled operations for the entire company within two weeks. On July 28, GM agreed to the investment to Flint Metal Fab and to keep Flint East open until at least 2000.The union agreed to cooperate on efforts to increase productivity at both plants. The strike cost GM an estimated US$2.8 billion. It's a confusing, chaotic trajectory, but the bottom line is that the place many Flintoids knew simply as Plant 43 is no more. Attached to this sad coda is some happier history: Flint East, under the aegis of the predecessor company Albert Champion Spark Plug, was also the last and most important location of Flint Faience and Tile, a world famous maker of fine decorative ceramic tiles. Spark plug ceramic-insulator kilns were very finely engineered, and worked best when kept at the precise, very high ceramic firing temperature 24/7/365. This however used a lot of energy, and the world of 1921 didn't need that many spark plugs, so the ovens were operating with no revenue being generated. Champion considered what else could be made in such ovens, and came to the conclusion that they should employ a large number of artists and artisans and make tiles. 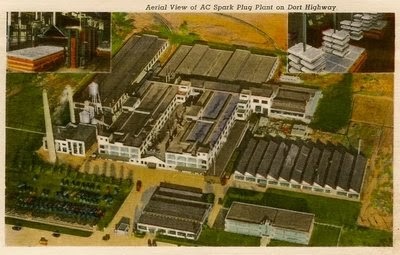 GM bought Flint Faience and Tile as well when they bought Champion, and operated it more or less unchanged until 1933, when they decided they could increase spark plug production enough that they no longer needed to manage a side-company they didn't particularly understand. So, Flint Faience closed. The northwestern-most building of Flint East was the old Flint Faience building, where the artisans created the beautiful tiles and prepared them to go through the firing ovens. The northwestern plant entrance, close to the corner of Dort Highway and Davison Road, had a blue tile surround set into the brickwork around the doors, and the name "Flint Faience and Tile" in custom tiles above those doors. Flint Faience tiles are still world famous and highly valued by collectors, in this 80th anniversary year of the end of production. Flint has been many things industrially over the past hundred years...a maker of hardwood lumber, buggies and wagons, car and truck parts, cars and trucks themselves, tanks and cannon shells. Our artisanal history rounds out that past nicely, in my view. Not all of us are done yet. I'll still be going through the end of the month, siding with cleaning up the place. I've been there for 12 years, starting at the old AC Spark Plug side. It's a pretty sad ending to it all for me. I can't imagine the feeling for those people that saw it in the truly good days. When I started there in 1994 it was called Plant 8. We were still the AC Spark Plug division of GM at the time. I remember living on Gold Ave. back in the 70's and seeing some in the neighborhood cutting thru the Kroger lot at Dort and Robert T up to AC for their shift.